A determined and energetic performance by the visitors from Sendai saw them leave Nagoya with all three points. Although they were a bit lucky to keep clean sheet, both teams hit the woodwork, their counterattacking style was much better suited to the wet conditions and they should have added a least one goal to their own tally. Time for Yanagizawa to hang-up his boots, as he should have done at the end of last season. Nagoya continued their recent trend of dominating possession, but leaving it late to claim all three points. This time it was potential title challengers Sanfrecce, who eventually succumbed 3-2, leaving Grampus in sole possession of third place, four points behind league leaders Kashiwa and Yokohama, with a game in hand. Another inspired substitution by the manager sees a player score on his return from injury. This time it was Naoshi Nakamura's turn. His blast of clear air turbulence proving the difference between a Vissel side lacking the guile to earn a point, and a Grampus team that did no more than they had to. This game got off to an inauspicious start, with both Vissel's Okubo and Tulio picking up early injuries that looked like seeing them get subbed early. However, both managed to play on for a few minutes and both eventually looked none the worse for wear. Unfortunately, the same could not be said of the pitch, which cut up easily from the opening minute. Okubo was the first to look like making a quick return to the bench. One burst of speed to create space in midfield, saw him tweak a muscle and spend the next few minutes limping noticeably. However, as the half wore on he gradually started to move a bit more freely again. Tulio was hurt in a typically robust tackle, and was also feeling its effects for several minutes. Overall, Grampus had the better of the half, but tended to try and be too clever close to goal. Tamada having a chance midway through the half, but slicing his shot wide. At the other end, Isomura made a timely block as Vissel's Hideo Tanaka advanced into the danger area. Takagi was also forced to come-out quickly to smother a Yoshida effort. The best effort of the half however, fell to Tulio who was brilliantly setup by a deft Josh back heel, but hit his effort weakly at Tokushige. Vissel came out looking the sharpr and more determined team in the second half. First Okubo shot wastefully wide and cutting inside to create a good opening. Ishibitsu then headed over from 6-yards with one of their best chances of the game. Their only other clearcut chance saw Okubo hit a tame effort from close range into the arms of a grateful Takagi. Meanwhile, Stojkovic had brought on Naoshi Nakamura for Isomura after 69 minutes, and the midfielder was soon settling into his alternating role of midfield terrier and support striker. It was s typical burst from midfield that saw him drive towards the Kobe goal, as the Vissel defence retreated, late in the half and unleash a wicked shot that left Tokushige floundering. Once again, Piksi had seen a player mark his return from injury with a goal. At this rate, Mu Kanazaki will owe us a hat-trick on his return. Midfielders Naoshi Nakamura and Makito Yoshida are expected to return to the first team for today's clash with Vissel Kobe. Naoshi may well get to start, having come through a practice game on Tuesday. Makito is more doubtful, but may at least make the bench. So we should have our Dream Team of Dani and Naoshi to dominate the midfield again. The Columbian has looked not half as effective without the industrious Nakamura to share the defensive load. With former Japan No.1 Seigo Narazaki also making rapid progress after his dislocated pinkie was expected rule him out for up to four weeks; he now looks at least a possibility for next week. This leaves only Mu Kanazaki of the regulars still out through injury. With Fujimoto and Ogawa settling into a good rhythm, the Mie native's direct approach is missed, but not as significantly as we might have feared. We are now over a dozen games into the season and the Vegalta reliance is proving as reliable as the Grampus concentration isn't. This was 6th draw in 13 games for Grampus, and 7th in 14 for Vegalta. Although this is a faltering start from the current league champions, there are still over 20 games to go and the team is nicely poised in the chasing pack. This was another game that saw Nagoya edge possession but fail to convert their chances. Indeed they had to rely on a former Grampus player, Makoto Kakuda, for their goal when his attempted clearance flew past Hayashi in the Sendai goal. However, the team's inability to maintain concentration at the back had already surfaced as the home team had snatched a the lead late in the first half. A late surge in an attempt to get the win saw U-22 forward Nagai introduced and Tulio pushed into attack, but Sendai held out for well-earned point. Ben Somerford also has a summary of the Aussie contingents' performance this weekend, and a more accurate description of the action at Toyota, in his piece for Aussie FourFourTwo. Igor Burzanovic, out for 6 months since rupturing ligaments late last season, made a surprisingly early return to action today. The Montenegrin came on as a late sub and scored the fourth and decisive goal in the 5-2 win over plucky Avispa. The Fukuoka team eventually finding themselves outclassed after a useful first half. Grampus were boosted by the return from injury of Masukawa, who passed a late fitness test, and Igor Burzanovic who made the bench. Both Narazaki and Danilson recovered from minor strains that had made them doubtful and started the game. So, somewhat surprisingly Piksi was able to field what was close to a full-strength team. Nagoya started well, but the visitors also defended well and had the occasional chance of their own. Noashi was released into space by a raking Danilson pass early on, but the midfield terrier was too slow to get a shot off and the chance went begging. Danilson was also making his physical presence felt in the anchor role and this allowed his defensive midfield colleague to take up a more advanced position better suited to his nature. Masukawa and Ogawa also had half chances, but failed to convert them. The gentle giant in particular, should have done better with a chance on the goal line. However, Nakamura's more attacking role soon paid dividends as his low cross was fumbled by the Avispa goalie and Kennedy pounced on the loose ball to give Grampus the lead. The lead was cancelled out almost immediately though, when Sueyoshi was brought down in the area and Okamoto calmly converted the resultant penalty. Grampus started well again in this half, and Kennedy setup Tamada to restore the the lead with a shot that took a deflection off the hapless Kamiyama. The Fukuoka 'keeper then mad amends for his earlier miss with a good save to deny Naoshi. However, the visitors would not concede defeat that easily and Shigematsu pulled them level again after 20 minutes with a deft header. Shortly after this, Japan U-22 speedster Nagai replaced Ogawa and thereafter, the game increasingly swung Grampus's way. Shortly after the half hour mark, Fujimoto restored the lead with a well-struck shot on the turn. Burzanovic then added the fourth shortly after coming on as a late sub. The Montenegrin scoring from an impossible angle, and picking up a yellow card for his understandably emotional celebrations. Tamada rounded off the scoring with a neat finish after Nagai had shown good hustle to keep the ball in play near the corner flag. Although the number of shots, corners and free kicks were fairly evenly distributed over the course of the game, Grampus dominated possession 63% to 37%. This level of control was eventually reflected in the scoreline as the visitors ran out of energy in the final 10 minutes. So what has Septic Bladder been for the last 13 years? He has just admitted that he runs FIFA secretively, refused to listen, was corrupt/inept and ignored public relations. If FIFA re-elects this donkey they deserve go bankrupt. The 75-year-old Swiss pledged to "open the doors, reinforce dialogue, improve our corporate governance and handle our public affairs with the kind of priority it deserves"
Septic Bladder and his FIFA cronies dead on their feet? A promising first half display by Nagoya in Suwon ended when Danilson tweaked a hamstring and had to be replaced after 40 minutes. Although the Korean's had taken the lead, when Yeom headed home a good cross that saw him outmanoeuvre Arai to make the space. However, overall the young defender had a good game and made some good interceptions and even had a rasping shot that tested the home 'keeper. He certainly showed enough promise to earn some more time alongside Tulio in the centre. On this evidence, he deserves to get the chance to challenge Masu and Chiyo for a place. Nagoya's chances of staging comeback ended with Danilson's twinge, as it forced Nakamura to withdraw to the holding position, where he is energetic but lacks the Colombian's presence and more constructive distribution. Any slight chance of a fightback was lost when Narazaki, took too long to clear a back pass, allowing a Suwon player to get a touch and setup an easy finish into the unguarded goal, midway through the second half. At that point, the Korean's closed up shop and played out the remaining minutes with everyone pulled back into their own half for most of the time. Arai Set to Make ACL Debut? It looks as though we may well get a chance to see Tatsuya Arai in action at last. He is said to be a serious contender for a starting role alongside Tulio in Korea tomorrow night. On-loan Grampus goalie Toru Hasegawa makes the bench in tonight's game in Gifu. With Tokushima having two good goalkeepers in Oh Seung Hoon and Hideaki Ueno, it looks like Toru has been working hard to get a chance. I hope he can prove that he is good enough to join Vortis on a permanent basis, or better yet that he can challenge Takagi for the number two spot at Grampus. Despite another poor performance, and yet another injury. This time Chiyotanda and Yoshida joining those keeping the physios working overtime. It looks like we may get a chance to see how Arai does in defence on Wednesday. Our six points, from six games, is far from convincing champion's form, but sees us rise up to 11th and still leaves us above both Cerezo Osaka and Kashima Antlers. The view from Canada! Why Canada? Grampus defender Takahiro Masukawa joined our list of injuries on Sunday, forcing the manager to shuffle Danilson into a central defensive role in an attempt to combat the rampant Mike Havenaar. (Personally, I think Piksi was a bit too effusive in his praise of the gangling forward, even if he is Dido's son. :-)) Masukawa is expected to be out for about three weeks. The clash this weekend against Kashiwa Reysol should give us a good idea of where Piksi's priorities are. With the ACL game next week, it will be interesting to see if he risks Tulio and Kanazaki, or indeed Josh Kennedy, at the weekend. All are expected to be fit again by then, but only just. The two 13-hour flights to the UAE took their toll on the players who made the trip. As a result, the team crashed to it first consecutive defeats in over a year. In the end, this was a game which saw us outfought by a hungrier team. Kofu outshot us 12-5 and looked much the stronger team in the second half, where they had the batter of the possession as well as the chances. It is hardly surprising that the likes of Masukawa and Ogawa found the game difficult after their excursion, especially as Yoshizumi has looked a bit off form all season. Even the sprightly Nagai looked a bit jaded. Grampus youngster Sho Hanai, who played in last Wednesday's ACL game, is out for four weeks with a torn hamstring. This might explain his somewhat lacklustre performance in that game. Grampus loanee made his long awaited return from injury today, in a 20 minute appearance as sub in Tokushima's 1-0 over cross-island rivals Ehime. (Blogger is back from the dead, so here is my view of the game in the UAE on Thursday morning.) Grampus had a good start in this game, but soon lost their rhythm after falling behind and were second best for most of the second half when substitutions and inexperience disrupted what little rhythm they had left. Grampus got off to a promising start. Makito Yoshida and Ogawa both having chances to give Nagoya an early lead. Yoshida saw his shot deflected over for for a corner, and Nagai setup Ogawa with a clear sight of goal, but he miscued the shot over bar. At this point Grampus were spraying the ball around well. Matsuo also had a crack at goal and Hashimoto won a corner with some tricky playnear the corner flag. However, the fell behind to a well-placed shot by Al Merry that crept in Takagi's far post. Initially, this setback did not deter Grampus from going forward, and Ogawa blasted wastefully over after more good work by Nagai. Ogawa also head over under challenge from keeper a few minutes later. But the home team always looked dangerous on the break and Elias added a second late in the half, after a good break down left. 2-0 down and a makeshift team faced an uphill battle to salvage something from the game. Stojkovic brought on Kuba for Yoshida for this half and the nippy youngster made a difference almost immediately. He latched onto Takagi's hoof upfield after 3 minutes, to burst into the box and setup Fujimoto with simple a tap-in from close range. Unfortunately, the home team restored their 2-goal cushion almost immediately. Matsuo conceded a penalty, a minute later, pulling a player back as he burst into the box although he fell more as a result of tripping over ball rather than Genta's attentions. Thereafter the game deteriorated into a scrappy game. Al Ain did not have the class to exploit their advantage and Nagoya started to look very disjointed. Although Teruki had a couple of cracks at goal, they posed little threat for the remainder of the game. So what of our youngsters, hoping to make an impression and catch the manager's eye and get the occasional chance in the first team? Well Ryo Isomura and Sho Hanai singularly failed to make any impression and can probably look forward to practice matches alone for the rest of the season. Only Hiakaru Kuba, Teruki Tanaka and possibly Koji Hashimoto can expect to see themselves given another chance. Genta Matsuo looked strong, but gave away some needless fouls and of course the decisive penalty. If he can improve his anticipation and timing, then his strength and stamina may see him get a reprieve. We will have to hope so, since he is the only obvious replacement for Hayuma. More details of FIFA's corruption revealed by Lord Triesman. BUt, surprise, surprise, UEFA are backing Blatter for reelection. In the third game to be held at Mizuno over the last week, Shimizu hold Nagoya to a evenly contested 1-1 draw. Both teams fielded nominal 4-3-3 formations, as Tamada resumed his striking role after last week's brace. He was soon on the scoresheet again as a Nagai cross gave him a simple header after only eight minutes. However, the lead only last for 10 minutes before a rare Narazaki error gifted the visitors the chance to equalise. The game kicked-off at a temperature of around 25 degrees, and remained it remained warm for much of the game. This saw several Grampus players cramp up towards the end, notably Ogawa and Abe. As expected, Nagoya played a cautious, possession game while Greentown defended resolutely. In midfield, Ogawa and Fujimoto took turns to drop back alongside Nakamura in defensive midfield. The home team looked content to keep the game tight and patiently wait for a chance to score. The visitors resorted to a simple plane that saw them look to their tall forward, but Chiyo and Masu were again in commanding form and their hopeful balls did not produce much danger. As a result, although we continued to probe for an opening, the Chinese pulled everyone back towards the end of the half, making it difficult for us to carve out a clear-cut chance. A fairly uneventful half ended 0-0. The visitors started to press a bit more urgently in the second half, knowing defeat would end their interest in this year's competition. For all their increased energy, however, it was Grampus that continued to control the pace of the game. Moreover, the visitors' more aggressive approach left them vulnerable to swift counterattacks. Abe and Nagai combined well to release Tamada behind the defence, but the former Japan international was fractionally offside as he closed in on the chance. Nagai, then sent over a perfectly flighted cross for Ogawa after 12 minutes, but the midfielder mistimed his free header and saw his effort come back off the post. As the halfway point of the half approached, the visitors finally started to get into the game, but were then hit with the classic sucker punch. A beautifully flighted pass from Fujimoto found sub Kuba busrting between defender in the penalty box. The speedster got to the ball first and was then clipped by the trailing legs of the Greentown goalie. A clear penalty, duly given, and Fujimoto converted the kick at the second attempt after his first had been ruled out for infringement. Grampus then ran out the clock with more possession football. Tulio was subbed midway through the first half against Frontale and Yoshimura was injured in training the day before, as our injury list grows. Josh also has a hamstring strain that will probably see him miss the next two games. Fortunately, it looks as though we will only have to get past Hangzhao on Wednesday with a makeshift midfield. Dani is expected to be back for the clash with S-Pulse on Saturday, and he may even make the bench tomorrow. A much improved display by the men in red sees them grab their first win of the season. A professional and hard-working performance, gives them a 2-0 over a useful Frontale team. Despite loosing Mu Kanazaki for this game, and Tulio after only 28 minutes, the team were too good for the visitors. Keiji Tamada marked his return with both goals, but setup by some good post play by Josh Kennedy, the second via a neat back-heel by the big Aussie forward. And once again, the manager managed to lift the team when it matters. This was a game in which Nagoya's theoretical advantage in match sharpness bore fruit. Despite an otherwise good game by Frontale they were always half a yard off the pace. Percentage wise it was a close game, Grampus edging possession 51% to 49%, but Kawasaki did not have their usual penetration and only forced Narazaki into one memorable save, although Tulio deflected an early effort by Inamoto that might have been dangerous. Frontale got off to the better start, with Inamoto and Yamase both having a couple of early efforts on goal, neither of which seriously troubled Narazaki. However, they lost Inamoto after only 13 minutes and this forced them to switch their most dangerous player, Kengo Nakamura, into a more defensive role. Thereafter, the game became the typically close battle that we have come expect from these two teams. Fujimoto sent a curling shot just over the the bar, after Frontale keeper Sugiyama had fumbled a clearance. Yajima responded with an effort for the visitors, that also flew just over. Josh Kennedy, looking more like his usual self, hit a shot on the turn, but was falling away from the ball and skewed it wide. As the game approached the half-hour mark, it was Grampus' turn to lose an influential player as Tulio's dodgy hamstring started playing up and he was also forced to retire hurt. Fortunately, Chiyotanda looked good and combined well with Masukawa to deny the visitors the sort of space in the box to test Narazaki. Nagoya took the lead when Kennedy won a header in the box and laid the ball off to his left for Tamada to send a right foot shot into the far corner. Frontale looked as though they had pulled level near the end of the half when Yajima slotted home after a good break by Yamase. However, the effort was ruled out for offside with no real complaint from the visitors. The second half saw Frontale again get off to the better start, with Yamasa creating a chance early on for Yajima but the forward was again found wanting for composure. Juninho, on for Noborizato, was also looking off the pace. The Brazilian is usually a one-man wrecking machine against us, but found our defence impossible to penetrate on this day. He had a couple of promising runs, but could not get past Chiyo and Masu. Meanwhile Tamada and Kennedy continued to look like adding to the Grampus lead. A good buildup saw Tamada burst through on the left of the box, but his first touch let him down and the chance went begging as the angle become too tight for a reasonable shot. This was followed shortly afterwards by another chance that saw Masukawa head over from five yards after a good break by Fujimoto and Tamada had left Sugiyama exposed again. Tamada then sealed the three points with his second, again combining well with Kennedy. The lanky Aussie did well to hold on to the ball near the edge of the box and his neat back heal sent his strike partner through to fire a shot past the hapless Sugiyama. Grampus then started to play for time with possession but continued to hassle the visitors when they had the ball, with Nagai harrying the defenders till the very end. After Tuesday's heroics in Seoul, it was back to J1 action for Nagoya today. But it was not a happy return to J.League action as they found Urawa in fine form. Our problems in defensive midfield, in the absence of the injured Danilson, came home to roost. Yoshimura and Ogawa proving utterly unable to hold Urawa back in the first half, when Marcio Richardes and Tatsuya Tanaka gave the home team a comfortable two goal lead. Tatsuya was having one of his good days, when he looks national team material, and it was his 12th minute shot that proved too hot for Narazaki to handle as Richardes closed in for the first goal. He then added the second on 25 minutes. We made a better sowing in the second half, but were always going to be vulnerable to the counterattack, as we pressed for a goal. And so it proved as Haraguchi burst through the middle and netted the rebound after Narazaki had parried his first effort. This weekend saw a full slate of J1 and J2 games take place in Japan. The first games since the opening weekend of March 5th and 6th for most teams. Despite having the advantage of playing some 'competitive' games in the ACL for the last couple of weeks, three of Japan's ACL representatives crashed to heavy defeats against fresher J1 opponents. Grampus falling to a 0-3 loss in Urawa, the Antlers also conceding three to the Marinos (also 0-3) in what was ostensibly a home game at National Stadium, and Gamba going one better, losing 4-1 in Hiroshima. Proof positive that the j.League is the best league in Asia. Here are a few other views of yesterday's game, and of the other ACL action this week. A battling 2-0 away win in Seoul sees Nagoya go top of their group i the ACL. Goals by Kanazaki and Nagai doing the damage. Seoul were good but lacked the composure to break us down, and we closed them down well to deny them time. A good performance from rookie, Yoshida in his first start saw him help setup the chance for the first goal. This was easily our best game of the season so far. The game got off to a fierce, combative start, with both teams playing hard from the whistle. Tulio was forced to make a good block from a dangerous chance early on and Ogawa fired off a rasping shot from 20 meters as both teams sought to get an early goal. Grampus were looking a lot tighter than they have done so far, and were closing down opponents much more effectively. This saw the home team restricted to taking pot shots from around the box, rather than being able to break us down. A fierce Dejan shot was palmed away, and the same player almost got his head on the resulting corner. GOAL! A closely fought game turned our way when Mu Kanazaki pounced on loose ball after an Ogawa shot, from a delicate pass by Makito Yoshida, fell invitingly for the Mie native. Having fallen behind, the home team pressed forward in search of an equaliser and had Narazaki and the defenders at full strecth for the remaining 15 minutes. Another long range effort stung Naraz's finger tips, who then had to react smartly to save a deflected shot shortly afterwards. Meaanwhile, up front, Nagai was operating as much on the left wing as striker, but without the towering presence of Josh Kennedy it rarely resulted in danger. Masukawa made a brave block on the edge of 6-yard box, the big man making the most of his size. Seoul's best chance of the half came near the end, but Dejan stumbled over his own feet after creating space on edge of box. His scuffed shot was easily saved by Narazaki. The home team wasted another chance to pull level when their other forward, Molina, dragged a shot well wide from a promising position. And so an fairly even half saw us go into the interval with our slim advantage intact. The home came out blazing at the start of the second half, and it took another Masukawa block on edge of box to clear an early chance. However, there commitment to attack meant that Kanazaki and Nagai caused problems with their speed. Mu, was the first to surge through, but blazed over after a good break from midfield. Fujimoto then almost released Nagai through the middle, but slightly overhit his pass. Yoshida almost through but the defender shielded the ball well and allowed the goalies to collect as the youngster closed in. Masukawa was having a monster of a game, the gentle giant making second good block of the half to spare Narazaki making a save. The Koreans then saw a deflected shot bounces just over the bar, but wasted the corner. Once this intital flurry of activity had dies down after about 15 minutes of the half, Nagoya started to retain possession a bit better and the game resumed the balance of the opening 20 minutes or so. Fujimoto won a corner with some tricky play on the byeline. Abe's volley from the cross sailed well wide. Keiji Yoshimura then ripped a blast that was tipped onto bar as we pressed for the goal that would make the game safe. Morina saw a curling effort drift just past Narazaki's far post. On our next counterattack, Nagai beat offside trap but failed to convert the chance from a narrow angle. GOAL! However, Nagai pounced on defensive error to nip in and round keeper for the second and silence the home fans. The game then played out as we sought to run out time and the home team lacked the energy to make a comeback. Next up, The Japan Times has an article on team's season to date, and the need to adapt. At the fourth time of asking (fifth, if you count the Super Cup), Nagoya finally get a win in 90 minutes. They romped to a comfortable 4-0 win over Al Ain in the ACL. The vital win resurrects their ACL campaign ahead of next week's clash with group leaders FC Seoul. Not the 4-4-2 formation the club lists, and Fujimoto and Ogawa interchanged freely, but this is a better indication of the positions Nagai and Kennedy took up. First half – Nagoya got off to a lively start with an Ogawa shot clipping the bar after only three minutes. A few minutes later Kennedy had a chance on edge of six-yard box but his control let him down. Al Ain finally took advantage of the space they were being allowed on the flanks and a shot from the right edge of the box flies over. El Ain gradually gained the advantage for the next few minute and Narazaki was forced into a good save after a break through the middle. However they fell behind close to the half hour mark when Kanazaki tucked home after being put through by a neat Kennedy lay-off. Al Ain came back strongly, and Elias blasted over after another dangerous break. Nagoya finally started started to gain the edge in possession in the final third of the half, but the UAE team continued to look dangerous on the break and were being too many free shots. Fortunately, it was easy to see why they have failed to score yet. Despite some promising positions they shooting was woefully inaccurate. Josh Kennedy looked set to extend our lead a few minutes but fluffs a chance from 2 yards after good work by Nagai. Al Ain midfielder Elias had a golden opportunity to pull them level after 38 mins sliced wide with the goal at his mercy. The half looked like ending with us holding out for a narrow one-goal lead, Kanazaki snook in ahead of Kennedy to nod home a second two minutes into the one minute of added time. Second half – The first chance of the second half fell to Al Ain who earned a free kick on edge of box after two minutes, but they failed to test Narazaki with another woeful effort. A much sharper looking Grampus were pressing far more effectively than in the first and this prevent the visitors from getting forward as much. This saw us gradually assume control and both Kanazaki and Kennedy drew fouls on the edge of box as the Arabian defenders started to struggle to contain our movement. Narazaki was only called into serious action once during the half when he tipped over a good effort from edge of box after 14 minutes. On the quarter hour mark, Nagai looked all set to add to the lead but slipped as he tried to volley home a cross from the right, sending his effort inches wide. A minute later, we did extend our lead when Keita (no relation to Sugimoto) put past his own keeper when Masukawa pulled the ball back across the face of goal after Tulio had challenged for the initial ball. 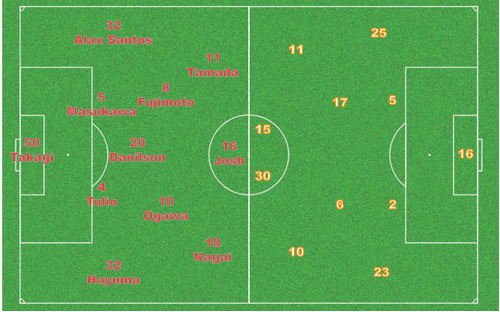 Stojkovic then switched to a 4-2-3-1 formation, with the introduction of Yoshimura for Kanazaki. This allowed Ogawa and Fujimoto to take up more attacking positions and the tactic soon paid off after Ogawa is put through after a neat ball from Fujimoto, but Yoshizumi fluffed his shot for an easy safe. Fujimoto was next, heading over from close-range after Nagai had scampered down the left and whipped in a testing cross. Shortly after the half hour though, Fujimoto felled as he broke clear through the middle. Fares Juma receiving a red card for his desperate lunge. Jungo calmly curled home the free kick. As the game wound down Grampus gave some time to young subs Yoshida and Isomura, but the team failed to add to its tally. It looks as though Roy Keane may take over at Melbourne Victory. However, some reports are playing down the prospects, but this may just negotiating tactics from those involved. This game saw Nagoya start their first competitive game for a month. The lack of match practice became increasingly apparent as the game wore one, with the visitors looking the better team in the second half. We started with Nagai upfront, alongside Kennedy and Kanazaki since Tamada is nursing a sore knee. Seoul started brightly in the first half, with their simple approach creating a couple of half chances, but they soon found themselves behind. Nagai pounced on a poor bit of control in midfield to burst through the middle and flick the ball home with the outside of his foot, as the keeper closed him down. Seoul pressed effectively to prevent us from establishing our rhythm, but rarely threatened themselves. A Fujimoto free kick was well parried by the keeper, after Nagai had been felled by a high challenge. After this we gradually started to establish our rhythm, but the Koreans kept us under enough pressure to prevent creating clear openings. Seoul again got off to slightly the better start, stringing some neat moves together, but again failed to test Narazaki. The speedy Nagai chased down a back pass and almost grabbed a second as the flustered keeper dithered and eventually had to clear hurriedly. Kanazaki and Nagai then combined well to set up a good chance for Mu, but the Mie native shanked his shot over the bar. However, the visitors looked calm in possession and pulled level when full back Choi Hyun Tae blasted home from 30 yards. Josh Kennedy being a bit lax in allowing the player time to set himself off. Seoul continued to look the slightly sharper, with both Ogawa and Fujimoto failing to impress. Both are more inclined to attack than defend, but the two have not gelled yet, in the three games the team has played so far this season. Fujimoto was replaced by rookie Makito Yoshida after 73 mins. Despite Seoul's edge in possession and speed of thought, it was Grampus that had the better chances to claim the victory. Nagai saw his snap shot drifts wide after the keeper had fluffed an attempted clearance, and late sub Chiyotanda rushed a shot in additional time. China's kung fu kickers look like they will struggle to find any one, other than corrupt gamblers, daft enough to give them money. Meanwhile the AFC still lets them play in the ALC. The home leg of the ALC clash with Al Ain from the UAE, postponed in the aftermath of the earthquake and tsunami, has been rescheduled for 12 April. Ticket information available in Japanese on the club's website. Grampus midfielder, Igor Burzanovic will be returning to Japan on Tuesday. Former Grampus stars, Keisuke Honda and Maya Yoshida will be part of the Japan squad that takes on a J.League select team, managed by Grampus manager Stojkovic, in Osaka next Tuesday. All 12 Europe-based players have been released for this charity match, despite the clubs not being obliged to release any of them. Toyota City is looking for volunteers who can help translate/interpret for people in the disaster area. The main demand is for English, but they are also looking for Portuguese, Chinese, Spanish and Korean translators. Lend a hand if you can. Finally, some slightly less hysterical reporting of the current situation. This game took place in the aftermath of the earthquake that struck Japan the previous Friday. Although the home club sent a message of sympathy to Gamba, their rabid fans showed no such compassion and the game saw them throw several objects onto the field during the course of the game. Of course, the wimps at the AFC will take no action to stamp out this violence. Tianjin came out looking much the shaper and better motivated of the two teams, and Fijigaya was forced to make an early save. Apart from wayward effort by Adriano, the opening few minutes were one-way traffic towards the Gamba goal. The home team had already seen one goal riled offside for offside, when they took the lead in the 25th minute, Chen Tao firing home a right foot shot. Lee pulled Gamba level a few minutes later, but the home team continued to look the more likely to add to their score. However, they failed to convert their possession into goals and the half ended with the scores still 1-1. Gamba fell behind, when late first half sub Takagi was carded for a 'foul' in the area. Defender Cao Yang converted the penalty to give the home team the lead. Gamba made a immediate effort to get back into the game, but could not implement their passing game effectively enough to really trouble the home defence. Adriano, Lee and Futagawa all had chances to pull the Blues level, Cheered on by the feverish home crowd, Teda regained the initiative and closed out the game to secure the three points and go top of the group. Tokyo Electric Power Co.,　(TEPCO) demonstrates to the world how not to control a disaster. Rookie Kensuke Nagai, proved a live wire when he replaced Mu Kanazaki 21 minutes into 2nd half. He forced a good save out of their Iikura and hit bar before being hauled back by Kurihara 4 minutes into added time. Josh Kennedy calmly converted the resulting penalty. Once the speedy Nagai came on, we had the better of the game, but the Marinos could easily have scored more than their one goal. Fortunately, they didn't and Nagai and Kennedy combined to ensure we claimed a share of the points. It was another less then convincing display, but the team can only get better as its understanding improves. A vital point to start our defence of the league title. And finally, here is the Japan Times view. The first of a series of posts linking to previews of the big Kick Off tomorrow. Nagoya fell to their Chinese opponents, mainly due to a lack of ideas when it came to breaking down their packed defence. We had much the better possession, but rarely turned it into clear-cut chances. Josh provided a weak finish to a good move midway through the first half, that was easily saved by their 'keeper. A disappointing result, but an encouraging game in that the understanding between the players can only get better. (Several promising moves broke down in the final third of the pitch.) Josh Kennedy also looked close to match sharpness, despite his weak finish on our best chance of the game. Kensuke Nagai made a lively impression, and should prove a useful alternative when Tamada or Kanazaki are unavailable. The Nagoya Grampus U-18s finished the group stare of the Viareggio Cup as group winners, with AC Milan at the bottom. A 1-1 draw with Sassuolo enough to secure the progress. The link below is to the match statistics for that match. Here is the page with the full schedule and group tables. Former Wolves thug, Kevin Muscat, is set to play in tomorrow's ACL opener against Gamba, despite being banned for eight games in the Aussie league. That ban does not apply to AFC games. Does this mean we will get to keep Pixie until 2014, when Wenger's contract expires? This was a fairly even 45 minutes, with both teams looking in reasonable nick. THe slick passing that highlighted much of the latter half of last season for Grampus was evident again. There were some promising moves, but the understanding between the players still needs a bit of work. However, it was the Antlers who had the best chance of the half. Osako rattling the bar with an effort from a tight angle that Narazaki got a faint touch on. The Antlers started this half looking the more aggressive, but fell behind when Masukawa nodded home a Fujimoto free kick in the 54th minute. Nozawa pulled them level 10 minutes later with a perfectly struck free kick that cleared the wall and flew in to Nara's top left corner. Neither team could grab a winner, so the game went to penalties. Ultimately decided in favour of the team with the better keeper. 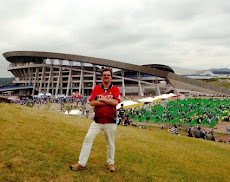 Will put up a 'translation' and link to the official Grampus report in due course. Here is the Orca's take on the incredible draw against the bigger and older AC Milan lads on Tuesday. This game seems to have been very similar to the recent Japan - Australia game in the Asian Cup final. The AC Milan youth team started well and much the better of the opening minutes. However, Grampus custodian Ishii and his defence held firm during a torrid opening 10 minutes. This allowed the team to find their own rhythm, which saw them start to probe the Milan defence. As you might expect of an Italian team, they proved hard to break down and the first half ended with Nagoya having been outshot 5:1. I am busy with other footy work at the moment, so you will have to take your chances with Google Translate for the time being. A summary will appear in due course. This saw Hanai in a more familiar role, but it was his move to the more defensive anchor role that suggest he may give Yoshimura a challenge for that position. Sho played a few practise games as centre back last year, and may well be able to give us a realistic option to Keiji Yoshimura. He would also be a bit more creative in the role, but lacks the physical presence that Danilson brings to the position. This saw Mu Kanazaki eclipse Josh as he bagged a hat-trick. Hanai again in a more creative role, with Isomura taking on the anchor role. This ought to be the more effective use of both their talents. J.League Teams Being Ripped Off? Reference.com: Football TransfersAn article that should be required reading for every General Manager and Owner in Japan. The formation images come courtesy of Teppei at the Rising Sun News, who has developed a system that makes it relatively easy to generate them. Expect to see a few more over the coming days as I add information about some the lineups we have seen in the practice games. Kume Puts Pixie on a Diet? For full details of the Grampus schedule (in Japanese only, I'm afraid), visit their official Game Schedule page. The Grampus league schedule is also available in English on the League's Club Guide page. Japan rode their luck, somewhat, in this game to win their fourth Asian Cup title and seal a place in the Confederations Cup. A textbook volley by Sanfrecce's Tadanari Lee early in the second period of Extra Time, seeing a valiant effort by Australia end in heartbreak. Australia proved worthy finalists, as they tested Japan more effectively than any of the the other teams they faced, and indeed should really have won this game if they had been able to finish off their moves. They had much the better of the game, but by the time Eiji Kawasahima had made his second brilliant stop at the feet of Harry Kewell in the second half, you felt it was never going to be their day. So it proved as a pin-point cross found Lee in acres of space, and he sent his perfectly struck volley arrowing into the net. Grampus new boy, Jungo Fujimoto, starting his first game of the finals, had a poor game and was replaced by Daiki Iwamaasa early in the second half. Not surprisingly, he looked a bit off the pace, and had few opportunities to show his attacking quality. This was true of the whole Japan team, which was curiously subdued for much of the game. The crisp passing and probing runs that had highlighted their play in this tournament was missing and they clearly missed the spark provided by the injured Shinji Kagawa. The World Cup blog's take on the upcoming Japan vs Australia final. The local media are making a big fuss about Shinji Kagawa's broken foot, but Fujimoto, Hosogai or Kashiwagi will all make perfectly good replacements. A couple of controversial penalties, and another hard, combative, close game between Korea and Japan. This game had plenty of drama, controversy and passion. It was a cracking game, despite the best efforts of the referee to ruin it. Japan eventually went through to the final after winning the penalty shootout 3-0, with Korea failing to convert any of the three kicks they had. Eiji Kawashima saved the first two, forcing the third kicker to miss in his effort to keep it away from the Japan keeper. Even with the help of 'home' ref, Qatar could not muster the composure to get past Japan in the first Asian Cup 1/4 final. A fighting display by Japan, saw them overcome the dismissal of Maya Yoshida to come back from 2-1 down to silence the home crowd and send Bruno Metsu's feisty charges crashing out of the tournament. The fighting spirit shown by Japan, along with the crisp passing the team has displayed in recent games, suggest that Zaccheroni may be able to take them to the next level. The passing still tends to look pretty without providing much penetration, but gives them more control of the game and with the likes of Endo and Honda in midfield, the extra time and space eventually pays dividends. "Money can't buy everything. This isn't an original proposition although proof of it sometimes comes in the most unexpected ways. Take the newly-minted revelation, courtesy of the Wall Street Journal, that Qatar set aside £26.5m for PR and marketing last year as it sought to persuade Fifa that the 2022 World Cup should be staged in a desert nation the size of Glasgow." 3-0 and Japan could have had even more. Saudi were cr*p and an embarrassment to the tourney. The JFA appealing a refs decision. Does this mean the J.League will also allow decisions to be reviewed, if there is a clear error? Probably not. They will just be embarrassed on Sunday Morning again, as usual. Japan overcome a controversial penalty decision to ease past Syria in another game they should won easily. The Iranian referee overruled his lineman, who had flagged for offside, and adjudged that it was a Japanese player who had played the ball back. Replays are far less convincing, but Japan manager Zaccheroni seems to have agreed with the ref, saying that they linesman had been wrong. They both must have eagle-sharp eyes. Meanwhile. Ryoichi Maeda had another poor game, wasting several good chances to give Japan a more comfortable margin of victory. Fortunately, Daisuke Matsui and Yasuhito Endo were back to their best and helped ensure that Japan got the three points they deserved. Young Nagoya midfielder Shinta Fukushima joins the ranks of former Grampus players in Tokushima. Jun Aoyama may have gone off to Urawa Reds, but his place in the squad has been taken by Fukushima. With Jungo Fujimoto joining the Grampus midfield this season, Shinta was going to find it hard to get regular playing time and this seems a good acquisition for the Naruto-based team. In a game they should really have won quite comfortably, Japan struggled to a last-gasp draw in their opening game of the Asian Cup. Maya Yoshida, headed home the equaliser two minutes into the four minutes of added time. The former Grampus defender had already seen a first-half goal cruelly ruled out for offside (Maya wasn't but Matsui was), and had been the unlucky defender to get the touch that deflected the ball past Kawashima for the Jordan goal. Shinji Kagawa, Tadanari Lee and Makoto Hasebe all had good chances to score but failed to do so. On the other hand, Jordan rarely threatened Kawashima's goal, apart from the deflected shot and a couple of chances when lax marking allowed them headers they should not have had. So, the Year of the Rabbit has got off to familiar start. Japan struggling to make their superior possession and technique count against determined but ultimately outclassed opponents. The most worrying aspect was manager Zaccheroni's reaction, who spent much of the game looking like a rabbit caught in headlights. Not an encouraging sign that he will be able to lift the team and get them to earn the wins they should be getting against this sort of opponent. Japan will have to get past several such teams during the qualifying rounds for the next World Cup. Ventforet Planning Quick Return to J2?